Rich in flavor and nutrition - that's SPIRU-TEIN! One of life's true pleasures is enjoying a delicious treat you know is good for you in every way. Nature's Plus is especially proud of its entire line of SPIRU-TEIN products. With zero fat, SPIRU-TEIN delivers a healthy infusion of plant-based protein, along with other essential nutrients. SPIRU-TEIN® Energy Shakes now feature our pioneering, patent-pending Tri-Part Protein Blend of non-GMO rice protein, pea protein, and both non-fermented and fermented soy. With 14 grams of protein, each serving of SPIRU-TEIN is a high-protein energy meal. Each delicious flavor has been meticulously engineered to provide a broad range of minerals and an incredible 100% of the Daily Value of all vitamins. 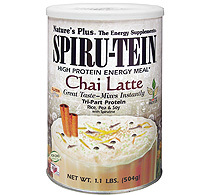 Suggested Use: Add one scoop (scoop included in can) of CHAI LATTE SPIRU-TEIN powder to 8 fl. oz. of skim milk, whole milk, or juice, and mix (or shake) until smooth. CHAI LATTE SPIRU-TEIN can also be served as a delicious and nutritious hot beverage. Simply mix, heat and enjoy! 27g carbohydrate (21g sugar) and 22g protein. CHAI LATTE SPIRU-TEIN MIXES INSTANTLY – NO BLENDER REQUIRED.